Longboard is regarded as one of the finest marvels one can ever own in his life. If it is not the finest one, then it has to be the perfect one. Longboard holds a special place in an adventure lovers' heart. Before you buy, decide how you will be using your longboard both today as well tomorrow. If you want it for basic traveling, then you don’t need it much flex. However, if you are an aspiring longboarder going to perform longboard dancing soon, then you need something strong with versatility, flexibility, and stability. Arbor Longboards are renowned for detailed work, quality, looks, and features. Here, in this longboard website you can always find your ideal ride. However, It is really tough to pick one among so many Arbor longboards. So, we have chosen and reviewed a few of the finest marvels (better say finest Arbor Longboards) for your consideration. 1. 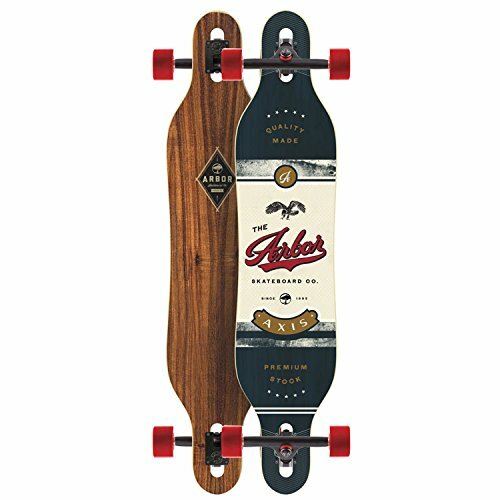 Arbor Timeless Longboard Complete, Walnut. 2. Arbor Catalyst Grip Tape Topsheet Complete Longboard. 3. Arbor Axis KOA 2015 Complete Longboard. 4. Arbor Axis Walnut 2015 Complete Longboard. 5. Arbor Mindstate Complete Longboard, Walnut. 46 inch (L), 9.5 inch (W), 32.25 inch (WB). 38 inch (L), 9 inch (W) 28 inch (WB). 40 inch (L), 9 inch (W), 30 inch (WB). 40 inch (L), 9 inch (W), 30.5 inch (WB). 37 inch (L), 12 inch (W), 30 inch (WB). 7 plies of Maple wood. 8-ply of Maple wood with KOA veneer top. 8-ply of Maple wood with Walnut top-sheet. Clear grip tape made of crushed recycled glass. Clear grip tape made of crushed cast-off glass. Lucid grip tape of compacted recycled glass. Pintail shaped with top-mounting deck. Low-center of gravity - stable even a high-speed. Concave shaped with a broad kicktail with drop-through mounting. Mild concave shape with drop-through mounting. Low center of gravity – stable. Look inspired by snowboards. Modern symmetrical shape with drop-though mounting. Classic pintail shaped with drop-through mounting. Recommended Caliber 50 10" trucks. 180mm RKP Paris or Gullwing trucks. SI Summit Series 71mm 78a wheels. Arbor 72mm 78a Freeride Series Wheels. Arbor Sucrose 70mm 78a wheels. Summit SI 71mm 78a wheels. Perfect for cruising, commuting and carving. Downhill riding, freestyle riding, cruising. Sliding, cruising, freestyle riding and carving. Ideal for riders with all level of expertise. For those who are stepping into the world of longboarding and looking for a good carver check out Arbor Timeless Longboard Complete, Walnut makes an excellent choice. This cruiser board is best if you are planning to use it for basic traveling, carving and cruising. Whether you are going to your class or planning to give your car a day off – you will certainly enjoy riding this longboard. Beginners who used this loved its wooden finish and medium flexibility. Sturdy platform with a low center of gravity; seems like this deck got everything on its side to please the riders. An experienced rider even tried riding it on the crack-filled roads of Philadelphia and rated an Arbor Timeless Pin ride as the BEST RIDE EVER. Look & Build – When it comes to the look, Artist Matt Smith did a spectacular job – traditional pintail shape with a classic wooden walnut veneer. Though the shape is pretty, but it is 46” long, 9.50” wide with an extensive wheelbase of 32.25" providing a wider platform for the rider to rest his front foot. It is a top-mounted deck that weighs around 8.82 pounds. This deck is made using seven Maple plies with a premium Walnut top with environmental water-based sanding fasteners. The manufacturer of this Arbor Timeless Longboard did a great job producing a lucid grip with crushed and recycled glass. Stability & Easy – With a long wheelbase of 32.25”, it offers a stable and comfortable ride around the sharp corners even at a high-speed. It facilitates deep carving and smooth cruising along the streets and hills. Flexibility-wise you can achieve medium flex while surfing those curves. Being stable, it is also easy to control the pace. Just an effortless push and you are cruising smooth ahead. However, it may not be a good idea to perform tricks on this rigid board. Recommended trucks and wheels – Not only Arbor Timeless Longboard is stunningly gorgeous, but also it comes complete with some of the best parts. It got fitted with Arbor Sucrose Initiative - Summit Series 71mm 78a Wheels along with 10” Fifty Caliber trucks, ABEC 5 bearings and Blood Orange 89a HR bushings. If you are addicted to longboarding then you are definitely going to love it. However, one should remember one thing that the wheels colors may be different that you saw in the picture while placing the order. Top-mounted deck with a classic wooden Walnut finish. 46” long, 9.5” wide with a wheelbase of 32.25” – extra stability. Eco-friendly, sturdy handmade deck made with 7 Maple plies. Clear grip adds to the aesthetic value of the deck. Ideal for commuting, cruising and carving. It is important to decide what you want from your longboard before you pay for one. If you are looking for a good sturdy longboard to start with and willing to use it for surfing across the town or down a hill, then you can trust this deck without a second thought. Not only it is economical, but you can also customize it according to your preference. Not ideal for performing tricks and dancing. One can narrow down his requirements to three vital concerns when it comes to choosing a longboard – durability, safety and if it is fun to ride. 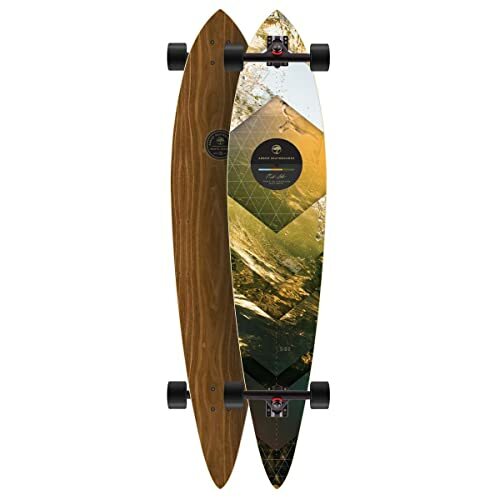 Arbor Catalyst Grip Tape Topsheet Longboard Complete, 38-Inch offers you a positive reply to all your three concerns. When you look at it, the first thing that holds your eye is its beauty. But, it is not all about its aesthetic value. It is a complete longboard packed with every other feature that you may yearn for. This board could be a little pricey, but durable and sturdy enough to achieve a 5 stars rating on Amazon. According to an Amazon customer, this board is nice, stable and worth being loved. Whoever purchased this board got positive feedback to share with others. Everyone complimented its flex, construction, sturdy built. No doubt! They call it a ‘GREAT PURCHASE’. Look & Build – Famous longboard graphic designer Max Neutra gave a tantalizing look to this longboard. It comes in a concave shape with twin-tip featuring a broad kicktail and a drop-through deck style. Whether you are descending a hill or up for a freestyle ride; it would be your best companion. This 38” long and 9” wide longboard has been manufactured using 7 Maple plies sealed with an eco-friendly water-based sanding sealer. Not to mention, the double layered fiberglass top and corners give it an exceptional sturdy finish. It gives you a safe feel throughout your ride. Lightweight, Versatile, Flexible & Effortless – The Catalyst board is shaped in such a way that you can easily cruise around on it, ride up a hill or even perform a few tricks with ease. In a word, you can actually use it for a wide range of activities. Being just 9.8 pounds, it is effortless to carry even in your rucksack. Not to mention, for this very reason it is pretty easy for the rider to hop on the board and put in a wide range of movements. With a wide wheelbase of 28” and adequate concave shape, it can effectively drop its center of gravity. All it need is a smooth kick to thrust the board ahead. The wide kicktail makes it easy and flexible enough to perform a power sliding and other tricks with absolute control. It got a clever design that sticks it out of every other longboard available in the market. Trucks, wheels, and bearings - Arbor Catalyst Longboard Complete, 38-Inch is an amazing board completed with ABEC5 bearings and spacers, Arbor 70mm 78a wheels and 180mm Paris trucks. It is a perfect design for every rider from beginners level to expert level. If you are planning to ride on aggressive streets, then you would find this board to be versatile and stylish enough to hold the gazes of onlookers around. It offers you performance, flexibility with utmost control even at a good speed – definitely a safe ride! Sturdy construction –7 Maple ply with 2 layers of fiberglass top. With 38” length, 9”width and 28” wheelbase – it is steady, flexible, versatile. Makes a great ride for recreation, rough street rides, downhill rides as well as cruising, freestyle riding. Lightweight (9.8 pounds) – effortless to carry and perform tricks. Fitted with premium quality wheels, trucks, and bearings. A little pricey – but justified when evaluated in respect of functionalities it offers. Arbor Axis KOA longboard is the bestselling longboard for years – they definitely have every good reason for that. This Axis longboard belongs to Arbor Drop-Through Collection. It comes with a medium flex so that you can cruise around comfortably even at a high pace and immense glides. Freeriding, sliding, cruising, mounting down a local hill – everything is just a flow of breeze with this Axis board. When it comes to customer reviews, it has bagged 5 stars reviews only, i.e. not a single negative or a mere good review. Every feedback speaks how amazing this board is. The riders simply love the entire look… Additionally, it is immensely popular among the riders for its great looks and flex. Unsurprisingly, “Love it” is something common in every feedback it has earned. Look & Build – Artist Kyler Martz gave this longboard an enticing look that everyone appreciates. It is 40”long, 9” wide along with a mild concave shape, and drop-through mounting style that gives rider and smooth and stable ride. It is constructed with 8 Maple plies along with a premium Koa wood top veneer using environment-friendly water-based sanding sealers. The Axis lucid grip tape is made of long-lasting compacted cast-off glass. Again, the added corners assure stability while making sharp turns. Lightweight, Versatile, Flexible & Effortless – Arbor Axis KOA Longboard is light, just 8 pounds along with a 30” wheelbase giving it stability and medium performance flex around the sharp turns. A rider can enjoy freeriding, carving, cruising and even sliding without worrying about wheel bites. With a low center of gravity, it is effortless to advance the board ahead, just a push and you are curving forward. Trucks, wheels, and bearings – Each and every gear fitted into this Axis board play a crucial role in winning the “Best-Seller” label for it. It comes fitted with 180mm Gullwing trucks, ABEC5 bearings, and 72mm Arbor 78a Freeride Series wheels. However, if you are planning to customize it according to your skill, purpose, and terrain, then you can also opt for Caliber 50 10” trucks, Arbor 71mm 78a Sucrose Initiatives – Summit Series and ABEC5 bearings. 8 ply construction with a Koa veneer top. Concave shape with a drop-through mount deck style. 40” length, 9”wide, 30” wheelbase – it is flexible, stable with great control. Best for cruising, carving, sliding, freeriding. Lightweight – 8 pounds only. Lucid durable grip tape made of crushed recycled glass. 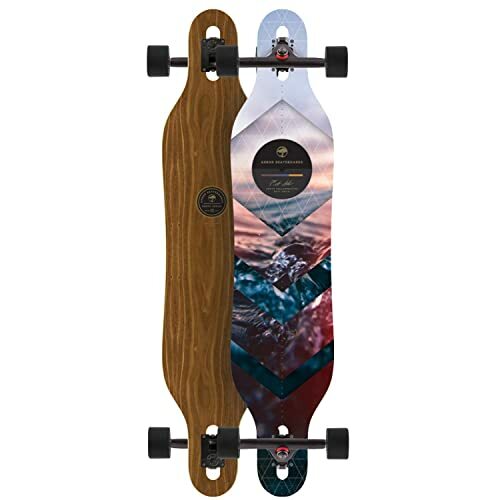 This Arbor longboard models is not only the best of the Arbor's top-rated longboards but also ranks among the best longboard listing on the whole. If you need something smooth for racing down the hill, this Arbor board would daze you for sure. It stunningly attractive and elegant. Inspired by snowboards, it comes in a perfectly symmetrical shape. Power-packed performance is something that comes complimentary with it. Those who bought this board find it "AMAZING". For the majority of the customers, riding this longboard has been smooth with no speed wobble. Everyone not only appreciated the look of the board but also the grippe wheels. However, a couple of the users also pointed out that the grip tapes wears off faster and that one need to re-grip tape it. Nevertheless, scoring 4.9 stars in today's date with so many longboards around is not a piece of cake. It has done a good job! Look & Build – Artist Matt Smith designed the look of this longboard. Unsurprisingly, it grabs the onlookers attention. It is 40" long, 9" wide along with a good wheelbase of 30.5". Inspired by snowboards, it got the unique and modern symmetrical shape with drop-through mounting. It is made of 8 plies of Maple along with a walnut veneer. Not to miss, it got lucid grip tape. It is sturdy, enticing, responsive and stable. Versatile, Stable, Lightweight & Performance - The shape and construction of the broad make it extremely stable while riding down the steep slopes. It offers rail-to-rail performance and adds power through the turns and slides. It weighs just 4 pounds. Thus, it is easy to control. All you need to give it a push and it would slide ahead effortlessly. Trucks, Wheels & Bearings – The board comes with either Paris 180mm RKP trucks or Gullwing trucks, Arbor Sucrose Initiative 70mm 78a wheels and ABEC5 bearings for added maneuverability. It is meant for cruising and carving around your town with ease! · Made of 8 Maple plies with a walnut top sheet by eco-friendly means. · Symmetrical shape with drop-through mounting. · 40" long, 9"wide, 30.5" wheelbase – good maneuverability, stable. · Best for relaxed cruising, carving around the town. · Lightweight – 4 pounds. · Arbor Sucrose 70mm 78a wheels are soft and grippe. Grip tape wears off faster . While talking about the best looking Arbor longboards with incredible features, Arbor Mindstatestate Complete Longboard worth mentioning. Not just it's good to look at, it is extremely popular among riders from beginners to professionals. It is a great choice for those picky riders who want to savor the taste of everything and seek for an all-rounder ride. It is a unique combination of classic pintail shape with a drop-though mounting, which definitely looks classy! Mindstate has earned a well-deserved 4.7 stars out of 5 on Amazon, which means people love it... It is great for cruising and carving around and even bombing down a hill. Perfect ride for a college student as well as an expert rider. It has also been referred as an "EYE-CANDY", which suits it perfectly. However, a few customers mentioned that they didn't receive with same colored wheels as advertised. But, can't really blame it on Arbor as they did already mention that. Built and Look – This Arbor board is made of 8 plies of bamboo with a walnut veneer which is tough and durable. It is 37-inches long, 12-inches wide along with a wheelbase of 30 inches. You are ought to get plenty of space under your feet. The classic pintail shape with drop-through mounting offers stability and comfort together without a doubt. Artist Matt Smith's creativity really shows up in this longboard! It got clear grip tape that doesn't interfere with the look of the board and keeps you precisely primed. Performance, Stability, and Versatility - With drop-through mounting, it keeps you closer to the ground that ensures great stability and maneuverability. It is also ideal to maintain your balance while riding. The perfect wheelbase lets you make those sharp turns with absolute control. No doubt, it is one of the best carving longboards you can ever find. Trucks, Bearings and Wheels - It comes with high-quality components including versatile Sucrose Initiative Summit 71mm 78a wheels, Blood Orange 89a bushings, ABEC5 rated bearings along with Caliber OG 10" RKP trucks. This very combination gives you a smooth and responsive ride that you would surely appreciate. · Sturdy construction with 8 Maple plies with a walnut veneer. · Traditional pintail shape with drop-through mounting – classy and comfortable. · 37" long, 12"wide, 30" wheelbase – good maneuverability, steady. · Best for cruising, carving around the town. · SI Summit 71mm 78a wheels with Blood Orange 89a HR bushings. · ABEC bearings with Caliber OG trucks. It is reported to have speed wobbles while riding downhill. Some boards are great for commuting, rigid and long in length, but with low flexibility. Some are good for beginners while some are appropriate for skilled longboarders. Some are extremely stylish and perform well. But, Arbor Axis KOA Longboard is perfect for a wide range of activities. It is rigid enough for casual commuting. It comes with medium flex so that you can perform certain tricks you watch professionals doing with skateboards. Again, if you want to bomb down a small hill or ride on a crack-filled street; you can have a smooth and comfortable ride with great flex to make the sharp arcs with this Axis board. It didn’t take a week-long to make its riders fall in love with it – a single ride has been enough. Every longboard website including TeamTSB finds it to be the BEST-SELLING board among all the Arbor longboard models. 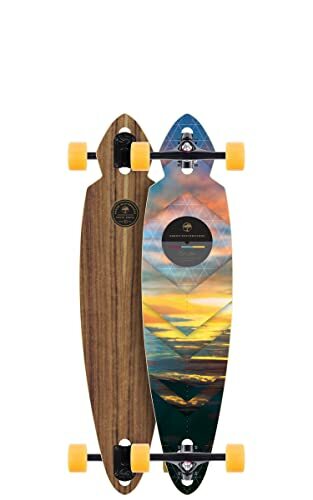 And then, click here to know about Sector 9 bamboo drop thru green wave lookout ii complete downhill longboard skateb﻿﻿o﻿﻿ar﻿﻿﻿﻿d﻿ review. Arbor Axis KOA Longboard is perfect for a wide range of activities. It is rigid enough for casual commuting.